Before heading to Porto Seguro we visited Sao Paulo where we spend three days after landing on Sao Paulo airport. 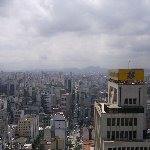 Sao Paulo is the largest city of Brazil and the main international airport where tourists arrive in the country and from where they travel up north up the coast, inland in direction of the Amazon, or southwards to visit other parts of South America. Sao Paulo made the impression of a industrial metropolis and I wasn't surprise to hear that Sao Paulo is the economic heart and commercial hub of Brazil. 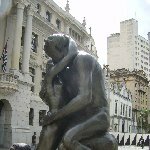 We spend three days sightseeing and visited the center of Sao Paulo making pictures of popular attractions like the Sao Paulo Museum of Art, the Sao Paulo Cathedral and of course Sao Paulo Downtown with its immense skyscrapers and chaotic traffic. The skyline of the city is at its best looked at from Sao Paulo's Jardins neighborhood. Other things to see would definitely include the Teatro Municipal de Sao Paulo and the Luz Station which are both beautiful archictual masterpieces. 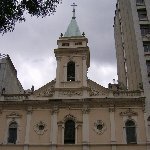 Did you enjoy Pictures of Sao Paulo and have you been on a holiday in Sao Paulo, Brazil?